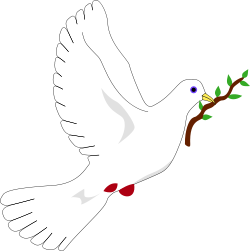 A peace dove, widely known as a symbol for peace, featuring an olive branch in the dove's beak. The Carnegie Endowment for International Peace is a private, nonprofit organization dedicated to advancing cooperation between nations and promoting active international engagement by the United States. Founded in 1910 by Andrew Carnegie, its work is nonpartisan and dedicated to achieving practical results. Through research, publishing, convening, and on occasion, creating new institutions and international networks, the Endowment associates shape fresh policy approaches. Their interests span geographic regions and the relations among governments, business, international organizations and civil society, focusing on the economic, political, and technological forces driving global change. The Carnegie Endowment for International Peace is considered to be a pioneering Global Think Tank. The Endowment offers leading experts on international affairs, particularly in the areas of Russia and Eurasia, China, the Indian subcontinent/South Asia, globalization, nonproliferation and security affairs. Andrew Carnegie, like other leading internationalists of his day, believed that war could be eliminated by stronger international laws and organizations. "I am drawn more to this cause than to any," he wrote in 1907. Carnegie's single largest commitment in this field was his creation of the Carnegie Endowment for International Peace. On his seventy-fifth birthday, November 25, 1910, Andrew Carnegie announced the establishment of the Endowment with a gift of $10 million. In his deed of gift, presented in Washington on December 14, 1910, Carnegie charged trustees to use the fund to "hasten the abolition of international war, the foulest blot upon our civilization," and he gave his trustees "the widest discretion as to the measures and policy they shall from time to time adopt" in carrying out the purpose of the fund. Carnegie chose longtime adviser Elihu Root, Senator from New York and former Secretary of War and of State, to be the Endowment's first president. Awarded the Nobel Peace Prize in 1912, Root served until 1925. In 1914, the Endowment helped created the Hague Academy of International Law. The Academy is housed in the Peace Palace in The Hague, Netherlands, and opened its doors in 1923. The 20th century saw rapid internationalization in all kinds of fields—from small business to terrorism to religion and social activism. Oddly, think tanks—even those whose interests are international—remained largely national enterprises, rooted in the views of one country. The Carnegie Endowment for International Peace was one of the first to break this pattern. In recent years, the Endowment launched the Carnegie Moscow Center in 1993, pioneering the idea that in today's world a think tank whose mission is to contribute to global security, stability, and prosperity requires a permanent international presence and a multinational outlook at the core of its operations. Building on the strength of this success and following its century-long practice of changing as global circumstances change, the Carnegie Endowment for International Peace is therefore undertaking a fundamental redefinition of its role and mission. It aims to transform itself from a think tank on international issues to one of the first truly multinational—ultimately global—think tanks. With operations in Moscow, Beijing, Beirut, Brussels, and Washington, the Carnegie Endowment will not only change its nature but is also likely to alter the way think tanks operate and can be effective in a global marketplace of ideas where a single national outlook is bound to be overly restrictive. Click here to read more about Carnegie's International Offices. Carnegie launched its New Vision with a series of events on February 5-6, 2007, a new logo, and redesigned publications and website. In these ways, the Endowment hopes to continue serving as a leading think-tank involving people from around the world in the effort to promote world peace. Carnegie has established the Junior Fellows program for graduating seniors and recent college graduates. Each year the Endowment offers eight to ten one-year fellowships to uniquely qualified graduating seniors and individuals who have graduated during the past academic year. They are selected from a pool of nominees from close to 300 colleges. Carnegie Junior Fellows work as research assistants to the Endowment's senior associates. Carnegie publishes a variety of books, policy briefs, papers, and articles/Op-Eds. Additionally, the Endowment publishes Foreign Policy, one of the world's leading magazines of international politics and economics which reaches readers in more than 120 countries and several languages. Finally, Carnegie offers a range of newsletters that are available by email subscription. History of "Carnegie Endowment for International Peace"
This page was last modified on 13 January 2017, at 14:54.